This week we’re very pleased to announce a new update that brings lots of new authoring capabilities to Power BI users. 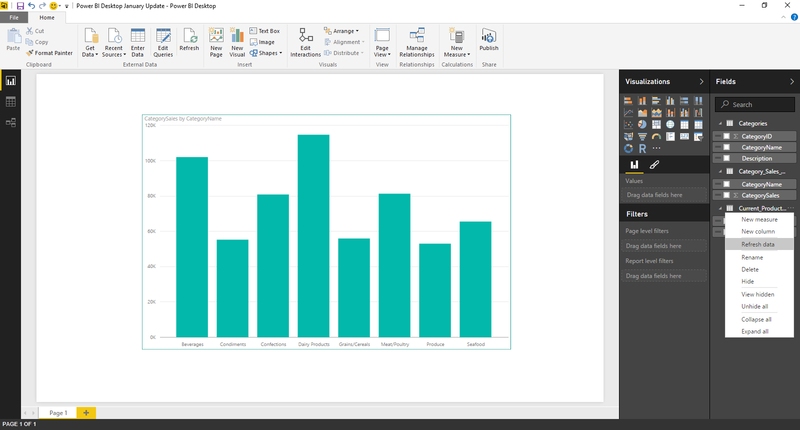 These new features are available in a new Power BI Desktop version, which you can download now, and also work seamlessly when those reports are published to the Power BI service. You can watch the following video or continue reading the following sections for more details about each feature. 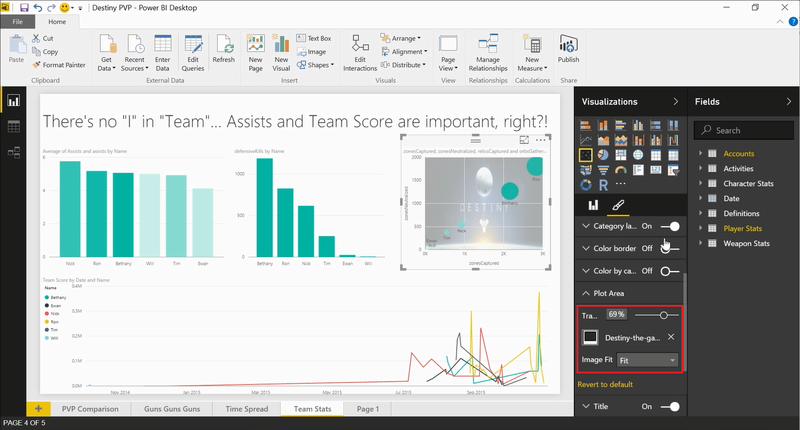 Users can now add borders to any given visual within their reports by going into the Formatting pane and leveraging the new Border section in this pane. In addition to adding a border to a visual, users can also specify the color for this border. We have added support for adding background images to the plot area of Cartesian charts and to an entire page. In order to change the background image for a page, users can go to the Formatting pane when no visual is selected and adjust this setting in the “Page Background” section. Background image for a Cartesian visual’s plot area can be customized also from the Formatting pane when a Cartesian visual is selected. This new option is available under a new “Plot Area” section. In addition to picking up a background image, users can control the level of transparency of the image and how it should be adjusted to the plot area (Normal, Fit or Fill). We have improved DirectQuery capabilities in Power BI Desktop by allowing users to create measures while using this mode. 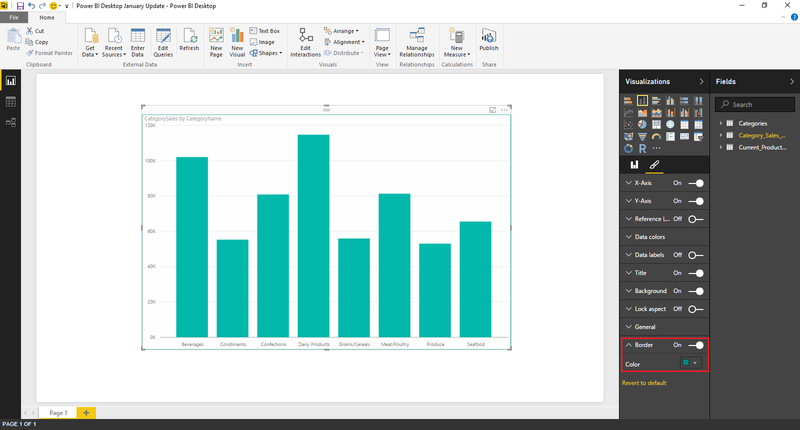 New measures can be created from the same entry points as when working in Import mode: Home and Data Tools – Modeling ribbon tabs from the Report & Data views, as well as from the contextual menu on any given table in the Fields pane. There are a set of DAX functions that have been disabled by default in DirectQuery mode. This is done in order to avoid performance issues with these functions when working in DirectQuery mode, as these calculations can get very expensive to run in the server. 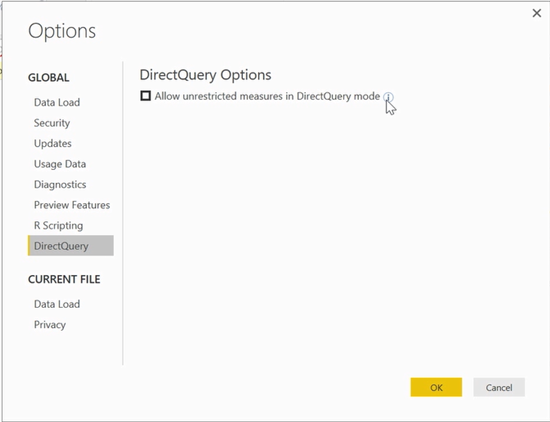 If users want to allow “unrestricted measures” in DirectQuery mode, they can enable this option in the Options dialog. 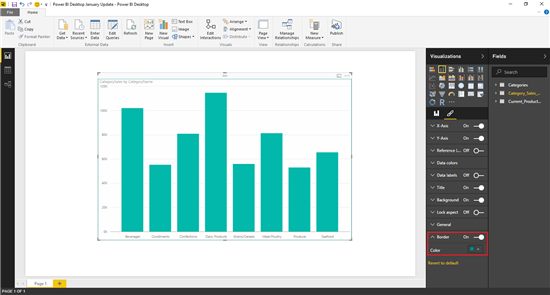 A couple of months ago, we released a Preview feature to allow users to explore and build reports on top of SQL Server Analysis Services Multidimensional models using Power BI Desktop. On top of that Preview feature, we released hierarchies support in the December update. This month, we’re getting this feature out of Preview stage and making it Generally Available (GA). This means that, while there will still be incremental enhancements in future updates to this feature, we have reached an acceptable level of functionality and quality on this feature so that it is now officially supported as a GA feature. We know that this was a long requested feature and want to thank all of you who tried out the Preview in the last couple of months. Your feedback has been extremely valuable for pushing this feature forward to reach GA stage this month! Learn more about SQL Server Analysis Services Multidimensional models Exploration mode. In addition to getting to GA stage for Exploration Mode in SQL Server Analysis Services multidimensional models, we’re also making enhancements to the support for hierarchy consumption. In the December update, we released an initial set of capabilities to consume hierarchies, but they lacked the ability to customize which levels from the hierarchy should be added to the report. Instead, it was an “all or nothing” choice. This month, we’re allowing users to control which levels from the hierarchy should be added to the Drill Down configuration. Users can drag the individual levels that they would like to include in the Drill behavior and Power BI Desktop will automatically include all levels from the root that are needed in order to get to the levels added by the user. Another connector that was added a few months ago in Beta stage was a connector for SAP HANA. This month, we’re very glad to announce that this connector has hit GA stage. Learn more about the SAP HANA connector in Power BI Desktop. Users can now refresh the data for a specific table from the Fields pane in the Report & Data views, instead of having to click “Refresh” in the ribbon, which would refresh all loaded tables. This “Refresh Data” option can be found in the context menu for any given table within the Fields pane. Users can now easily append more than two tables within a single Append operation. In the Append tables dialog, users can switch between “Two Tables” and “Three or more tables” modes. The new “Three or more tables” mode allows users to be much more efficient when trying to append several tables together. Without this mode, users had to append tables one by one as different steps (or modify the underlying generated M formula). 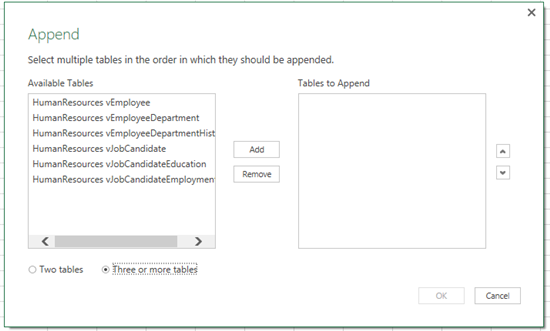 While this new mode is extremely powerful for advanced scenarios, we also want to ensure the simple scenario of appending two tables remains as easy as it used to be, so the default mode for the Append dialog is still “Two tables” mode. Users can switch between these two modes by using the radio-buttons at the bottom left corner of the Append dialog. 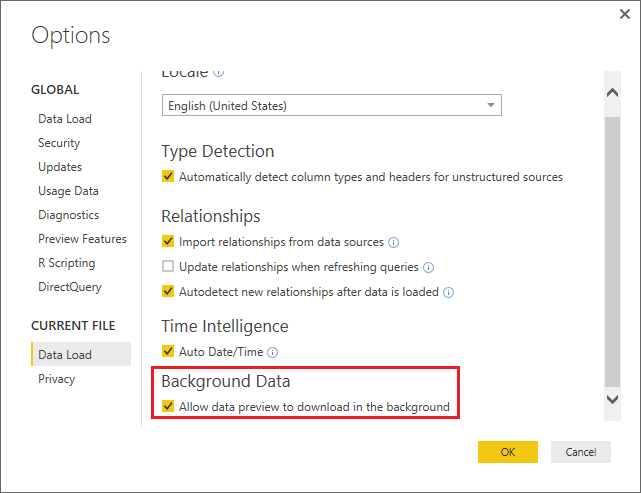 We have added a new file-level option to disable downloading data previews in the background. Changing the default behavior would reduce the amount of data being processed in the background by Power BI Desktop, which may be ok for users who do not need to preview queries locally. This new option can be found in the File -> Options dialog, under “File Options – Data Load” tab. Starting with this release, there is no longer a requirement to have at least Internet Explorer 10 in order to install Power BI Desktop. The minimum browser required now is Internet Explorer 9. 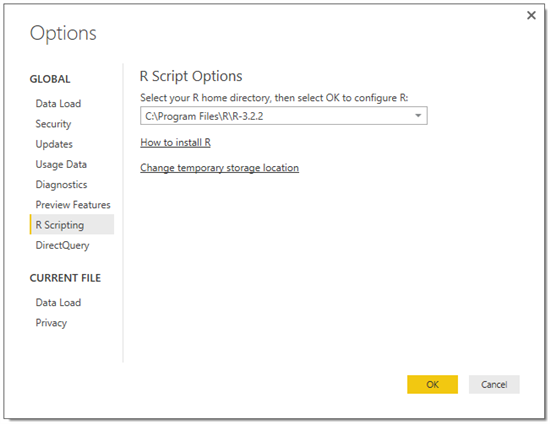 – Option page “R Scripting” tab: This new tab in the Options dialog allows users to specify the location of their R environment. Starting with this update, users can pick the location from a dropdown menu which includes all detected R installations as well as the ability for the user to specify new ones. This setting is common to both “R Script” data connector and “R Visuals”. Support for Unicode characters and spaces as part of the R environment directory path. Support for localized number formats (i.e. such as using “,” for decimal separator). That’s all for this week. We hope that you find these updates valuable and continue sending us feedback about Power BI in our forums, Power BI Desktop “Send a Smile/Frown” or by voting for what you’d like to see next in Power BI. We will randomly select three survey respondents to each win a $50 Amazon gift card. Winners will be notified by February 11, 2016, and a list of winners may be requested by emailing ucsurvey@microsoft.com after this date. 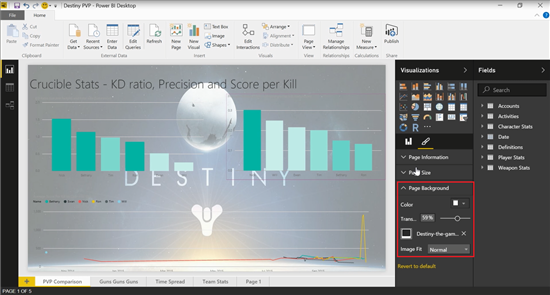 For our sweepstakes rules, please refer to http://www.microsoft.com/usability/uxcsweeps.htm. To be eligible for our sweepstakes, you must complete the survey. You must also be a U.S. Citizen or Permanent Resident with a valid Social Security Number. Only one entry into the sweepstakes will be eligible per person. In accordance with IRS regulations we are required to collect 1099 information (your address and social security number) if the suggested retail value of gratuity items that you select exceeds $599 in a given calendar year. We will not ask you to provide any tax information in this survey, but will contact you before shipping your gratuity item, if necessary. Questions regarding gratuity issues may be directed to ucsurvey@microsoft.com.